Mumbai, March 14, 2017: Patronage of good design raises the standard of living. For decades, Hamilton has been consistently developing functional products with optimal practical value using simple but ingenious and distinctive designs. For this achievement, “India Design Mark”, one of the highest design standards in India honored the Hamilton Design Team with a certificate at their recently held event in Coimbatore, Tamil Nadu. India Design Mark is an enrichment tool granted by India Design Council. It is an autonomous body, established by the Government of India, functioning under the aegis of Department of Industrial Policy & Promotion, Ministry of Commerce & Industry. Two of Hamilton’s innovative products which got this prestigious recognition were the Duplex Bucket and Microwow. 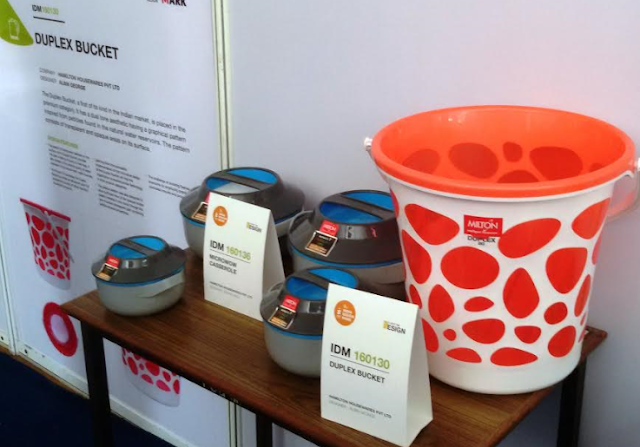 A bucket is a product of very low involvement wherein all products in this category look very similar except a few changes in the colour, prints or handles. So, while designing the Duplex Bucket, Hamilton’s design team innovatively made it half see through and half opaque that helps keep a check on the water level from a distance. A first of its kind in the Indian market, it was designed with a dual tone aesthetic having a graphical pattern inspired from pebbles found in the natural water reservoirs. The pattern not only made it look more beautiful & colourful with the double layer but also added to the strength making it more sturdy and durable. At Hamilton, every new product is designed keeping in mind how that product can solve a problem for the end user in the category. In India, people need hot food. Each time the food needs to be heated, it needs to be transferred to Microwavable container in order to heat it and then transfer it back to the casserole (So that food remains hot on the dining table). As a result, multiple utensils need to be washed as well. Keeping this in mind, Hamilton designed the Microwow casserole which can be directly placed in microwave for heating because of its steel insulated body. Apart from this, the casserole reheats very fast – you reheat for 4 minutes and the casserole maintains temperature for 4 hours and is dishwasher safe too. It is a premium category product for Indian households and also for the export market. The products underwent a systemized process of evaluation which constitutes the India Design Mark logo that acts as a symbol of distinguished excellence of the product. With the “India Design Mark” certification, Hamilton has distinguished itself through continuous inventive design and has set new standards. Hamilton Housewares Pvt. Ltd. is one of the leading manufacturers, wholesale suppliers, distributors and exporters of house-ware products across the globe formed in the year 2000. Since its inception in 1972, Milton, one of its flagship brands has carved a niche for itself amongst its customers as a pioneer of the house-ware industry. Today, the company is propelling ahead with numerous brands under the Hamilton group and has become a pride of every home across India and other global destinations. Hamilton's flagship brands, Milton, Treo, Claro and Spotzero are designed for people who appreciate and desire quality products. Hamilton is sold across all channels – B2B, B2C, CPC (Central Processing Centre), Retail Outlets and Online. India Design Mark is a design standard, a symbol, which recognizes good design. India Design Mark symbolizes excellence in form, function, quality, safety, sustainability and innovation and communicates that the product is usable, durable, aesthetically appealing & socially responsible. It provides strong differentiation and market positioning as a design and innovation leader. It acts as a brand extension and imparts competitive advantage to the product in local and international markets. It serves as a unique promotional launch pad for new products and services entering the market.